Do Model based initiatives pay off? That is the central question that this research report answers. Can engineers save time by transitioning to Model Based Definitions or is it something that takes more time but yields benefits later in development? That is the question that many executives struggle to address when thinking about making such a change. 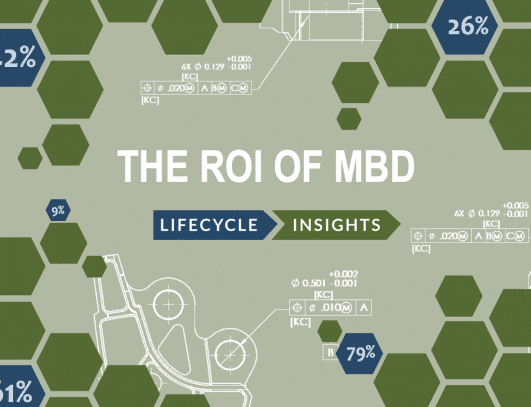 Sharing findings from The ROI of MBD Study, which collected survey responses from 463 respondents, this report provides detailed metrics on the performance of engineering organizations that have and have not adopted MBD initiatives. Within these findings, there are important lessons learned about how to and how not to take on such an effort. For engineering executives and managers, this eBook is an important reference for any organization considering the deployment of a Model Based Definition initiative. For those leading such a change, it offers quantified facts for and against specific methods of adoption. Do Model-Based Definition (MBD) initiatives provide tangible benefits? In talking with manufacturers and suppliers, that’s a question I get time and again. At this point, most people understand the theoretical benefits: MBDs take less time to create and reduce downstream errors and delays due to their unambiguous nature. However, many people still wonder if that kind of advantage is proven to manifest in some measured improvement. Answering that critical question is the purpose of this report. Here, you will find new research findings on which MBD practices and methods translate to productivity gains and downstream benefits, both for engineering and the company as a whole.